Parent: Please tell me about the camp program. Will my son choose his own activities? Jon: We have a LOT of fun at camp and really help kids develop skills. We have over 40 activities that campers can choose from in addition to exciting group activities, games, special events and trips – it really is hard to go home at the end of the summer. We try to strike a balance between choice and non-choice activities. The number of choices you get to make depends on your age. Older boys are given more freedom and responsibility while we give our younger campers more guidance. have one more special activity after dark. Many parents have specific goals for their son each summer so we will work with you to make sure that his activity choices match up with your goals. Parent: My son has special dietary needs. Can you accommodate him? Jon: Not a problem. 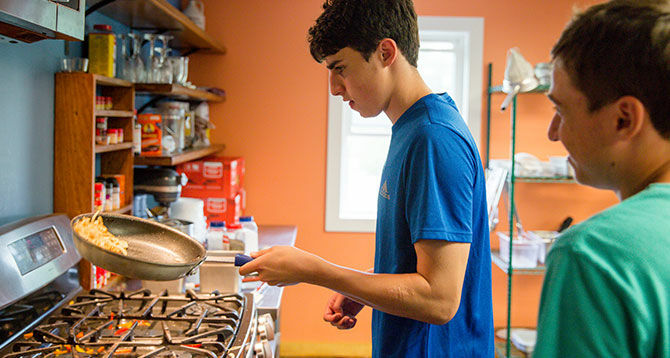 We’re a peanut-free camp and our chef is well trained in dealing with all types of food allergies. We assign both campers and staff to tables so we can monitor camper diets. There are always alternatives to our main entrees so even picky eaters will have something to choose from in addition to the salad and fruit bar, which is always available.